Group of wonderful tiny miniature wooden animals were hancarved in Erzgebirge Germany aboout 1880. A fine piece of Folk art from Erzgebirge Germany. Beautiful large antique wooden Musical example of "Roly Poly". Detailed face painting and multi-colored dress in bright colors. Extremely colorful figure, musical base, Handpainted papier mache. Excellent condition. Minimal signs of wear. Germany ca 1890. Made of Papiermache and wood, finely painted details. All original. No restoration. Size L. 20 cm/ 8". H. on Platform 23 cm /9"
Large wonderful "Jack in the Box toy". Pilot made of Papier mache, Germany. This Pilot is rare as a wonderful large "Jack in the Box toy". 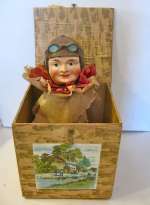 A big very well molded papier mache pilot jumps up of box, when the lid opens. 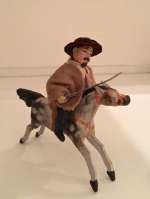 Excellent detailed painting and the condition is very good. The box is decorated with a lovely chrome litographed scrap. . A very nice piece! Turn of the . Century. Size of box closed 6"x 4 1/2"x4 1/2" (15,4 x 11,5x 11,5) When open the pilot i n is 9" tall/ 23 cm. A little wear to lid of the box due to age. A rare set of spinet dancing miniature wooden carved dolls. Germany.Folkart. Dollhouse. Antique NOAH`s Ark large scale barge bottom wooden painted Noah`s Ark ca 1890. 49 cm /19".Wonderful brightly painted large scale wooden Noah`s Ark from 1890.Barge painted in brown, deck and house in green, yellow and blue. Red window trimmings-matching the roof. Roof to open for anmal storage. Comes with 26 animals. Size: 19"/ 49 cm Excellent condition and as noted below. Note: some breaks to animals,slightly different nuance to one roof side. 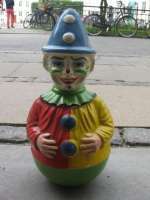 Early magic clown on a wooden stand. Ca 1860. 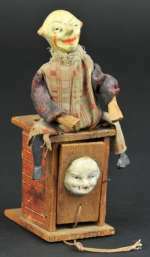 Wonderful early wooden toy of a magician composition hand painted clown seated on a painted clown seated on lithographed paper covered wood stand with composition face at front. When string is pulled, a dog's head appears and the clown lifts his arm. H.6 1/2" / 16, 5 cm. Very good all original condition all over. Ca 1860.